"The Most Gorgeous Lady Blessington"
Thomas Lawrence’s portrait of Marguerite, Countess of Blessington, which is part of the Wallace Collection, shows the sitter in all her beauty and splendour. But in 1849, when it hung in Marguerite’s Kensington home – Gore House - the painting served as an unpleasant reminder of faded glory and changing fortune. 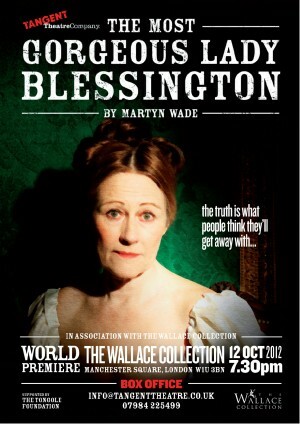 "The Most Gorgeous Lady Blessington" tells a story of money, fame, scandal and the press – a story with striking contemporary parallels. Tangent Theatre Company has commissioned the play from dramatist Martyn Wade, who has adapted classic works for radio (including "The Barchester Chronicles" and "The Pallisers"), and written biographical plays (subjects include Benjamin Britten, Oswald Mosley, John Wesley, and Diogenes the Cynic). His latest play for Radio 3, about a tennis court quarrel between the Earl of Oxford and Philip Sidney, is due to be recorded early in 2012. Jilly Bond (Pascale in “Island” at the National Theatre in Spring 2012) will play Lady Blessington, as she did in Chrome Audio’s production of the Journeys through France & Italy. She is known to listeners to Radio 4 for her roles of Bridget in “The Archers” and Susan Grantly in “The Barchester Chronicles”. In the spring of 2011 she appeared as Mrs Warren at the English Theatre of Hamburg, in “Mrs Warren’s Profession”, which Die Welt described as “the perfect rendition of Shaw” and The Times said of her reading in “A Book of Liszts”, again for Chrome Audio, that it was ‘flawlessly performed’. She will be joined by a distinguished actor, playing all four male roles in the piece, which promises to be an enthralling tour de force.